= Would you like one? Hi, everyone, It has been over a year since I started this blog. It has been a great pleasure to get to know all the interesting people in the world, and I love reading all the comments and messages. I really appreciate your feedback and support! ありがとう( = arigatou) , Thank you!! I have always wondered if all my lessons are the right level. There are so many people! Although I know it is impossible to satisfy everybody — you have different interests and levels — I do aim to please. Some love manga and want to learn colloquial expressions and others really want to study the more “standard Japanese” and learn things like 敬語 ( = keigo) , honorific expressions, grammar patterns or tough words that will help them prepare for the JLTP exams. There are tons of good resources out there. If you want to learn Japanese more systematically, I would say this site may not be the best site for you. I usually make lessons randomly — preferring to focus on things that interest me or things that interest you — like when you send me questions. For that reason, I have been avoiding making lessons for total beginners. However I cannot deny that there have been more and more requests from viewers to make lessons for Japanese newbies. So to satisfy these new Japanese “puppies”, I will try to make more basic lessons from now on. But for those whose level is no longer that of a beginner, don’t worry! I will still try to include stuff that you may be interested in and that you may not have picked up in other “human” texts. So please check out my lessons — even if it says it’s for beginners. Today we will learn how to count things in Japanese. Now before I teach you anything, I better warn you! (Play ominous music.) Just in case you didn’t know, one of the most difficult (and some say annoying) things about Japanese is that different shaped things take different counters. I suppose it’s how you use different words to describe different large groups of animals. A pack of French bulldogs is fine, but you can’t say a “pack of fish”, right? You have to say a “school of fish.” Well Japanese counters are similarly limited to object types. Let’s get started. 一つ ( = hitotsu) one piece お一つ ( = ohitotsu) is more polite Would you like a sweet? OK! Let’s learn Japanese numbers! How much are these? I will tell you 5 different numbers. Listen and write them down! = Sumimasen. Kono keeiki sanko kudasai. = Excuse me. May I have three of these cakes? =Gomennasai. Mou niko shika nokotte imasen. =Sorry. We only have two left. = Kongetsu wa eiga wo yonhon mo mita. = I saw four movies this month. = Can you give me a cigarette? = A box of cigarette, please. So 箱 = はこ・ぱこ（ = hako/pako) is a unit to count things that come in box shapes. I know the kanji 本 also means “a book”. Do you know how to count books? Books are counted with the 冊 = satsu counter. = Toshokan de hon wo sansatsu karita. = I borrowed three books from the library. If you count something flat, a piece of paper, plates, pizza, pancakes, slices of bread, etc, you count them with 枚=mai. = ichimanensatsu ga ichimai mo nai. = I don’t have any 10,000 yen bill. = Kopii juumai totte kueru? = Can you make 10 copies? = Nanmei sama de irasshaimasuka? = How many in your party? For counting days, go check my time related lesson! = Oishisou! hito ( ) choudai! = Umm looks delicious! Can I have a bite? = Sumimasen, ocha / gohan mou i ( ) kudasai. = Excuse me! May I have another cup of tea/a bowl of rice please? = Ichinichi ni banana wo 1 ( ) taberu to karada ni iirashiiyo. = They say it is good for your health to eat a banana a day. =Saifu no naka ni Sen en satsu ni ( ) to ichiendama i ( ) no okaeshi desu. =I only have two ¥1,000 bills and one ¥1 coin in my wallet. = I want a computer. = Kono kutsu (or sokkusu) wo 1 (　) to suutsu wo ni (　) kudasai. = May I have this pair of shoes (or socks) and two suits please? = Tsukarete mou i( ) mo arukenai. = I am so tired that I can’t even take “one step“. = I have never been to India. = Osushi ni ( ) onegai shimasu. = Two portions of sushi, please. = Inu ga san ( ) tori ga ni ( ) zou ga go ( ) imasu. → 一口 = ひとくち= hitokuchi ：….口 = means “a mouth” 一口食べる = ひとくちたべる = hitokuchi taberu means to eat a bite. = Kuruma ga nidai butsukatta. →１回 = いっかい ( = ikkai) or １度 = いちど ( = ichido) means once. Additional information from the comment section. Basically you can count fruits or vegetables with 個 = こ ( = ko) or 一つ ( = hitotsu) , 二つ ( = futatsu) . . .
if it is something “round” like a ball, you can use “玉” （= tama) (grapefruit, orange, cabbage, onion, etc. ),you use 房 = ふさ ( = fusa) for a bunch of grapes or bananas, but if it is one piece of small fruit or a vegetable such as a strawberry, grape, pea, or cherry, you use 粒 =つぶ ( = tsubu( . You use 束 = たば ( = taba) for cauliflower or broccoli. Or bunch of spinach etc. •accidents, inquiries, phone calls → 件 = けん ( = ken) . Vehicles: Depends on where they are used…. First of all, do you know how to pronounce 198? 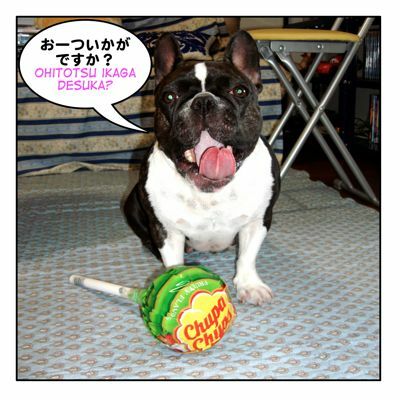 It has a special pronunciation, いちきゅっぱ！= Ichikyuppa! You can combine with other figure like 298, 398, …598, etc. But the pronunciation is 298=にっきゅっぱ ( = nikkyuppa ) 398=さんきゅっぱ=sankyuppa! 598 = ごっきゅっぱ ( = gokyuppa) ! Many stores use this ~98 ending often to attract consumers. If they see the price 2,000 and 1,980 or 20,000 and 19,800 Even if there is a small difference, we think 198 is much cheaper and buy that product. This is a TV commercial of 缶コーヒーBoss ( = kankoohii Bosu) =caned coffee, BOSS. with 宇宙人ジョーンズ = Uchuujin Jones=Alien Jones. Try to listen to 198 ( = ichikyuppa) ! (If you are not familiar with this TV commercial go check my 温泉=onsen lesson. I explained why Tom Lee Jones is working everywhere in Japan. = Kyou kara hataraku Jones san deesu! = This is Mr.Jones. Today is his first day of work. = Kono wakusei no juumin wa butsuyoku ni shihai sareteiru. = The residents of this planet are controlled by materialism. = Ikiru tame ni hitsuyouna mono nado sonnnani aru hazu ga nai noni. = We don’t really need so much in order to survive. = Sumimasen, kore douyatte tsukaun desuka? = Excuse me. Could you show me how to use this? = Ominogasi nai you ni, hai, 1-9-8 de gohoushi shiteorimasu. 「宇宙人だ！」 = Uchuujin da! =Alien! = Kono wakusei no juumin wa ichikyuppa ga daisuki da! = The residents of this planets love 1-9-8! = Kono ressun ga shokyuusha no hito nimo joukyuusha no hito nimo yaku ni tateba iikedo. Now hope this lesson serves for both beginners and advanced students! = Watashi mo itsumo 1-9-8 de omocha wo kacchaimasu. = I tend to buy toys at 1-9-8! hello maggie-sensei, first of all, thanks for the lesson! I have a question, I see those kind of numbers (２０万６７００円) on news web easy quite often. How do I count those? Thank you! You write 二十万六千七百/ 20万６千７百 but it will be easier to read with fewer kanji for shopping. So, you just use the first kanji 万 and type out the rest with number and add 円. No we hardly use them anymore in modern Japanese. こんにちは先生！私は元気です。Sensei, are you a teacher in real life? Your teaching is amazing. I’m glad that I can study from your site. Japanese counting system is the most complicated. I’ll try to understand and practice more on this.. I hope I’ll master this someday. I hope you are doing fine and everything is ok. I need your help to explain to me and give me examples about this counter.. I know it is hard to figure out how to count when the figure has lots of zeros. Thank you for this, sensei! Your lessons are really helpful! You’re so informative and I’m learning more that ever! I’ve heard rumors that you were a good teacher. I’m glad I decided to check it out! Thank you for finding us!! Check the index and check the lesson you like. Feel free to leave a comment or a question anytime. By the way, do we use mai for counting paper bills too? And what can we use to count coins? That’s right. we use 枚=mai=when we count paper bills. Coins are tricky. We both use 枚=mai and 個=ko. so do u count magazines/manga etc with satsu like the books? Yes you can count magazines/manga with satsu. 第(=dai) + number +巻 (=kan)　Ex. 第一巻 = Dai ikkan = Vol 1. So you are planning to come to Japan? You will learn a lot then. Thank you for checking the lesson! Actually there are a lot more…It could depend on the shape, the size, where you use them, for what you use them, how they are made, if it is alive or not, etc. Basically you can count fruits or vegetables with 個 = ko or hitotsu, futatsu . . .
To be more specific, if it is something “round” like a ball, you can use “玉”=tama (grapefruit, orange, cabbage, onion, etc. ), you use 房=fusa for a bunch of grapes or bananas, but if it is one piece of small fruit or a vegetable such as a strawberry, grape, pea, or cherry, you use 粒=tsubu. You use 束=taba for cauliflower or broccoli. Or bunch of spinach etc. Moving things : vehicles: Depends on where they are used…. Oh my… it looks very complicated! Hope I didn’t scare you here!